Calls for more walkable and bicycle-friendly cities and a lack of local data for these modes of transport got me thinking about Marikina. The city has its own bikeways office, the Marikina City Bikeways Office (MCBO), that was under City Planning and Development Office but borrowed staff from other offices of the city. The MCBO has gone through many challenges since the time of Bayani Fernando, who instituted the office, and his wife Ma. Lourdes under whose terms the office was downgraded. I’ve learned that the office has been strengthened recently and is implementing a few programs to promote cycling especially among school children. I wonder, though, if Marikina has been collecting and keeping tabs on cycling related data. I recall that during the conduct of the study for the Marikina bikeways network, it was established that there was a dearth of data on cycling and data collected pointed to cyclists primarily comprised of workers in factories or construction sites in the city and neighbouring areas. These are the regular commuters using bicycles instead of motorised vehicles. It would be nice to see if these increased in numbers (observations along major roads like Sumulong Highway seems to support the increase) and if there have also been shifts to motorcycles as the latter became more affordable in recent years. Enforcement is still an issue with regards to the bikeways as not all paths are segregated. 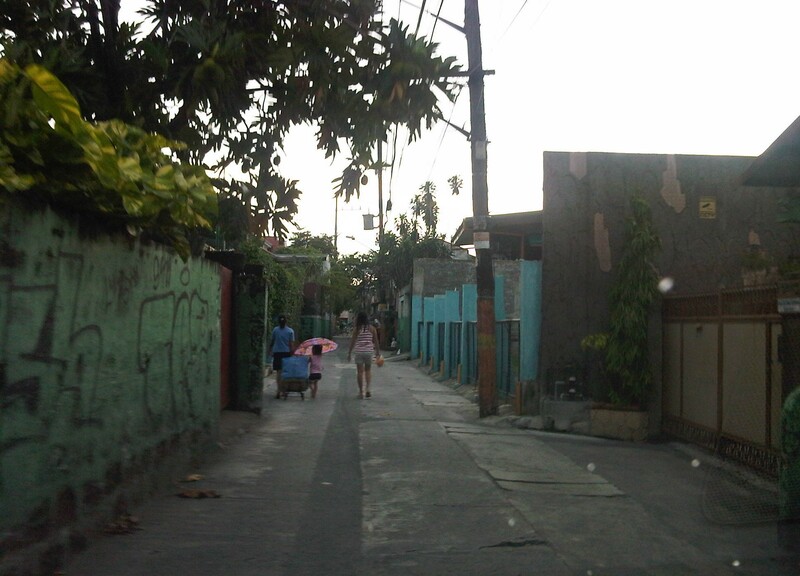 As such, those lanes painted on the roads are more susceptible to encroachment by motorised vehicles. Still, Marikina is a very good example of realising people-friendly infrastructure and many LGUs could learn from the city’s experiences with the bikeways. Recently, some students consulted about designing bikeways in other cities as well as in a bike sharing program being planned for the University of the Philippines Diliman campus. These are good indicators of the interest in cycling that includes what discussions on the design of cycling facilities and programs intended to promote bicycle use especially among young people. We strongly recommended for them to check out Marikina to see the variety of treatments for bikeways as well as the examples for ordinances that support and promote cycling. I’ve always said that transport and traffic problems will always take a back seat to flooding. Traffic also takes a back seat to floods in this post. Issues like congestion and terrible public transport services are experienced by many everyday but basically do not stop people from their routines. Floods on the other hand are a major inconvenience that makes things like congestion or getting a ride during the rush hours much worse. Floods also have a way of making things stop as people cannot go to work and students cannot go to school. It seems that whenever there are floods, everything grinds to a halt and productivity takes a dive. Such losses, of course, are in addition to the cost of damages directly brought about by the floods. The following photo was taken by a staff of our office who was going around near his home. Fortunately, their place was not flooded so that afforded him time to go around and take some photos of the swollen Marikina River along Marcos Highway in the Pasig-Marikina border. These extreme floods have been happening more frequently lately. I think these extreme rain events brought about by typhoons or monsoons are the norm now and we should be more prepared than ever in dealing with such heavy rainfall. Flooding can be alleviated if not eliminated and the experiences of some flood-prone LGUs can help us in determining suitable approaches to alleviate the problem and mitigate its impacts. The philosophy applied by previous administrations of Marikina City did not have the objective of eliminating flooding. That was too expensive for a growing city that needed to put resources to other aspects or areas of development. The main objective was to alleviate flooding; mainly to reduce the depth as well as the duration of flooding. That is, instead of having waste-deep waters, perhaps knee-deep would be more tolerable. And instead of having to deal with flooded homes or streets over a day or more, half a day would make life better for people affected. The key was to address issues that led to severe flooding. Such issues include poor drainage stemming from inadequate maintenance of facilities and the still tremendous amounts of garbage irresponsibly disposed off by people, especially those living near waterways. Marikina, Antipolo and Cainta at least should consider building retention basins in order to mitigate serious flooding. A lot of waterways were lost as residential subdivisions were developed and developers responsible for these should bear part of the burden by doing their part (e.g., identifying and turning over or donating lands than can serve as sites for the basins) in helping alleviate flooding. One friend pointed out that the critical time for flooding would be when rains are heaviest (e.g., last Thursday to Friday for Mario or the 6 hours of extreme rains by Ondoy in 2009). Basins should be designed so they can accommodate waters from the rains during the critical period so that instead of neck-deep floods, perhaps there will only be knee-deep or waist-deep waters. Yes, there will still be floods but they will be more tolerable and perhaps faster to dissipate than when you don’t have the basins to mitigate such events. There will be significant costs for such facilities but then the costs surely don’t compare to the annual losses that can be attributed to flooding and relocating whole communities definitely is much more costly and is not an option for those in the Marikina Valley and other food prone areas. Floods have been issues for many LGUs during elections and whoever can come up with a good plan to alleviate flooding will surely win a lot of votes. Among many peoples’ pet peeves in traffic would probably be the propensity for lane changing among many drivers and riders. 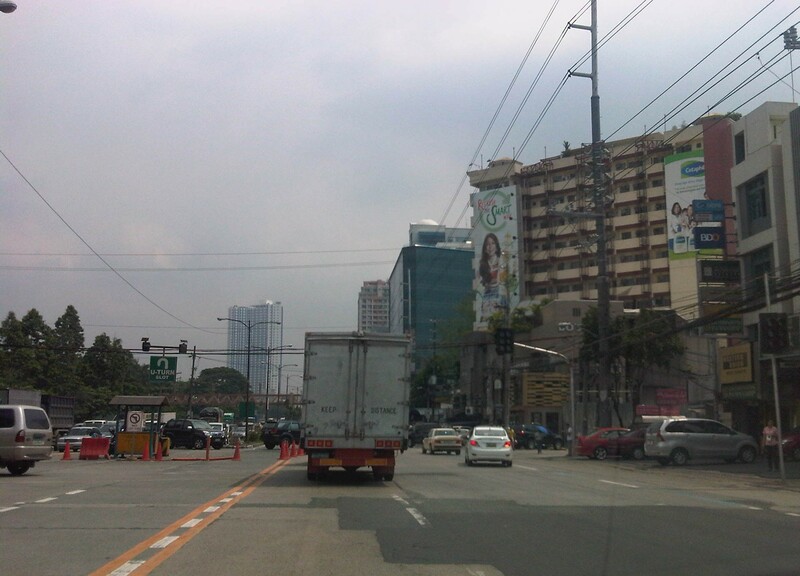 This is especially true for wide multi-lane roads like Commonwealth Ave., Marcos Highway and EDSA. While it can be an understandable behaviour for free flowing traffic along long stretches where weaving can be executed safely, lane changes can be quite risky at intersections and may instantly lead to crashes. These are likely the bases for the swerving violations that the MMDA and other traffic enforcers became notorious for issuing for a time. We chanced upon a scene at the Commonwealth Ave.-Mindanao Ave. intersection in Novaliches where a car seemed to have attempted to cut in front of a bus in order to make a turn but got hit by the bus. From the angle of the collision, it appears that the driver of the car likely maneuvered for a U-turn and made the critical assumption that he could beat the bus for the turn. It was obvious that the bus was in the right position while the car was not. This is often the case for drivers who do not care for positioning themselves along the correct lanes at intersections and seem to rely on their guile to get ahead of others. Such drivers might just be the same ones who would likely do counter-flows also to get ahead of others queued along the right traffic lanes. White car attempts to make a U-turn right in front of a bus and gets hit by the bus whose driver likely did not notice the white car sneaking in front of the vehicle. September 12, 2014 10:53 am / 1 Comment on Repair C6 now! In a previous article, I had written about the Urban Transport Study for the Manila Metropolitan Area (UTSMMA), which was completed in 1973 and proposed, among others, a rapid rail transit network for Metro Manila. The government proceeded to undertake a feasibility study for the first line of that network almost immediately afterwards. However, something happened a few years later that effectively contradicted UTSMMA’s recommendations and, from what the documents available to us now suggest, effectively doomed the future of transport in Metro Manila. 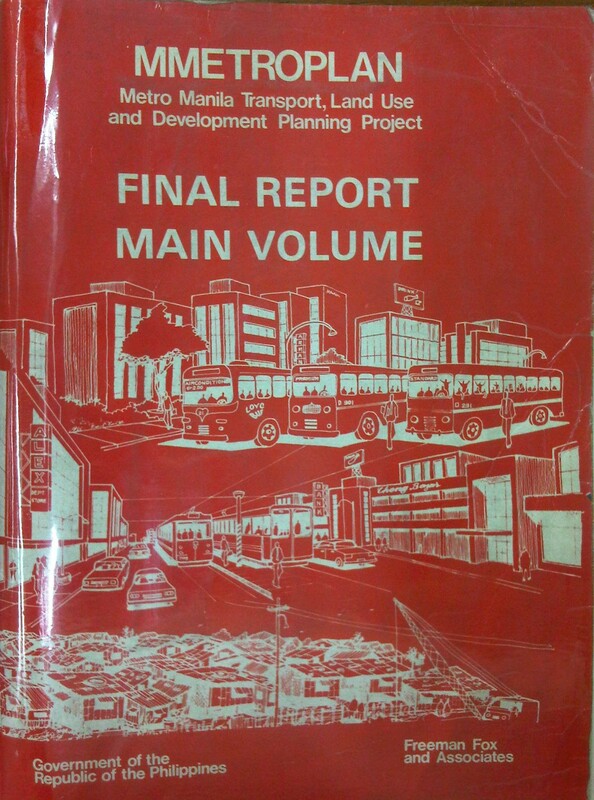 The Metro Manila Transport, Land Use and Development Planning Project (MMETROPLAN) was implemented from January 1976 to February 1977. It was apparently commissioned by the Philippine Government, and funded by the World Bank, which commissioned the precursor of Halcrow Fox to do the study with a steering group comprised of senior government official dealing with transport at the time. The MMETROPLAN project team is shown in the photo below. 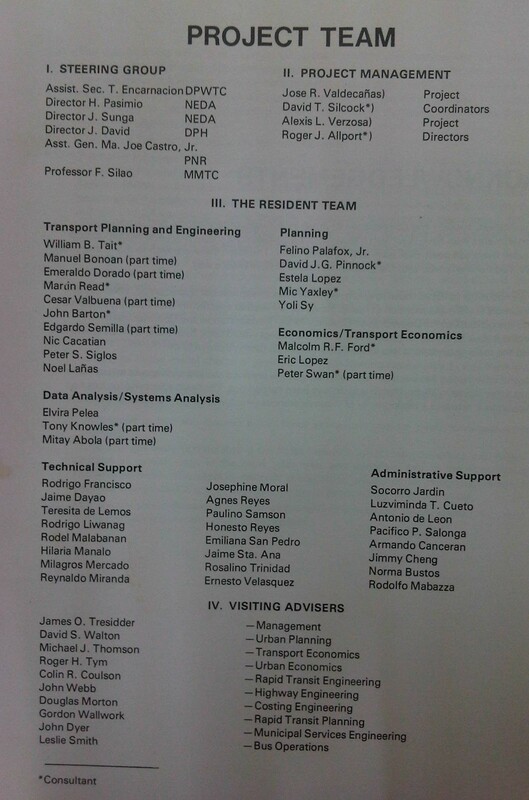 Note the inclusion of some familiar names particularly from the DPWH and DOTC who were then with what was the Department of Public Works, Transportation and Communications (DPWTC) and Department of Public Highways (DPH) before these were reorganised. Note, too, a familiar name under Planning, who is very much active today with his own advocacies. MMTC buses should operate missionary routes, which are generally unprofitable routes. There should be no arbitrary exemption on franchises like in the case of MMTC. MMETROPLAN also touched on the route structure for road public transport. However, its most far-reaching recommendations on road public transport concern the issuance of franchises for buses and jeepneys. The study recommended that franchises should be issued for a period of a few years instead of 25 years and to define a minimum LOS. The study cautioned against arbitrary restrictions on franchises for buses at the time while mentioning that there were already restrictions for jeepneys. MMETROPLAN further recommended the encouraging of small operators for both jeepneys and buses. “Heavy Rapid Transit (HRT) would provide public transport passengers with much faster journey, but by 1990 would attract only 2.5% of motorists and would have negligible impact on traffic congestion. 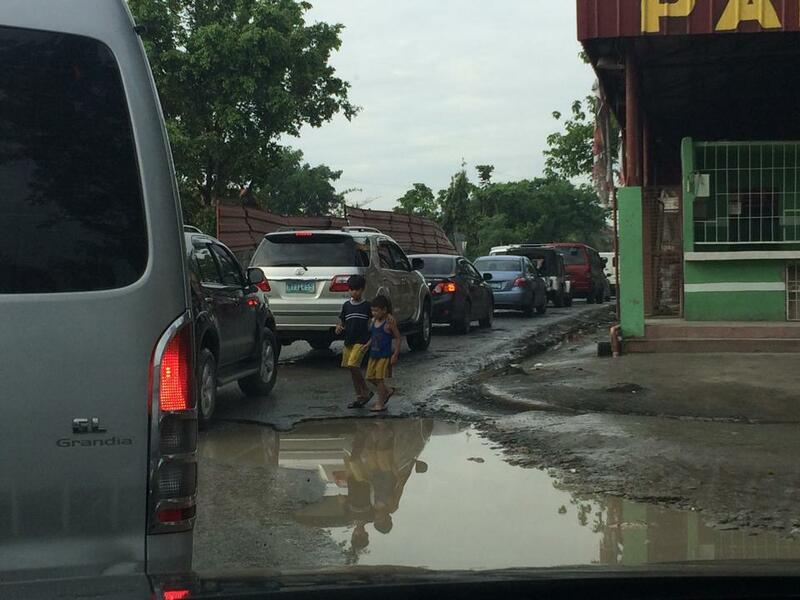 Partly because of this and partly because of its very high capital cost, it would be hopelessly uneconomic: the annualized capital costs would be higher than the estimated benefits in 1990…passenger flows are not high enough to exploit its full capacity…and the large savings in time for public transport passengers are not given a high value in Manila, and are not high enough to persuade motorists to change mode. The study also did not have good words for the PNR as it concluded that its “routes related poorly to the major demands for movement” and that it would be expensive to improve the PNR at the time. PNR costs were compared to buses and jeepneys with the further concluded that these road transport modes are preferred over an upgraded PNR. MMETROPLAN assessed the LRT vs. the Monorail in the context of cordon pricing and bus lane strategies. 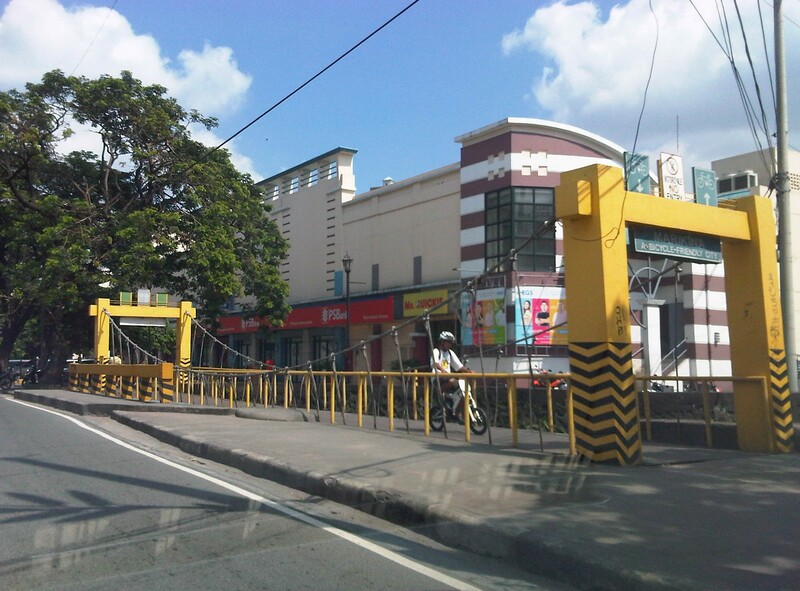 While the monorail was dismissed for reasons that included few monorail systems operating at the time, the study recommended for an LRT along Rizal Avenue, which was considered feasible. These conclusions and recommendations by MMETROPLAN would eventually have far-reaching impacts on Metro Manila’s transport system and the study would be among the most cited in discussions and future planning where land use and transport are discussed in the same light. For land use planning, the report also provides us with a history of land use planning for Metro Manila, which we can now compare with what actually happened. That is, if the plans made back in the 1970’s were actually implemented and to what extent were they realised. Many of these plans remain controversial to this day and are often invoked whenever there is talk about the perennial flooding and the spectre of earthquakes threatening much of Metro Manila and its surrounding areas in addition to other issues like the transport and traffic problems experienced around what has become a megalopolis. But what could have influenced the MMETROPLAN study team and government officials to debunk UTSMMA? Why the “about-face” for something that seems to be the JICA Dream Plan circa 1970’s? UTSMMA and the rail rapid transit network, after all, was the product of a vision for future Metropolitan Manila transport by a visionary professor from the University of Tokyo – one Dr. Takashi Inouye of that university’s Department of Urban Engineering. I think the next article will provide us with the answers to these questions regarding the turnaround. Abangan!